In June 2016 four friends gathered around a table. Ricard was working on his PhD thesis, which I supervised, and summoned the help of a data expert, Toni, and someone knowledgeable on analysing networks of people, Oriol — later on Núria Vega would join the team to improve the whole project and, specifically, bring brains and muscle to the field work. At that time we believed that ICTs were having an impact on agriculture and people working in agroecology and cooperatives. But we suspected that there was something else. In Catalonia, cooperatives were changing the shape of the agriculture sector in the XIX century. After a long hiatus during the Spanish dictatorship (1939-1978), the agriculture cooperative sector (with quite republican ideas attached) kept on being dormant… until the breakout of the World Wide Web in the mid 1990s. That was more than a coincidence to us, so we decided to analyze it — it was Ricard’s idea: the rest just followed. But soon we saw that there seemed to be much more than just a rebirth of cooperatives: what was being deployed before our eyes was something new. Beyond using ICTs to improve management and/or make sustainable non-mainstream models that can barely compete with the big behemoths of the food industry, what we saw whas that ICTs seem to be configuring a brand new ecosystem of food production and consumption, including new ways to understand food as a public infrastructure. Almost three years after comes this article of us, with these reflections formerly put and rigorously analyzed. The result is Impact of information and communication technologies in agroecological cooperativism in Catalonia , just published at Agricultural Economics (AGRICECON). While we waited for the paper to be published, Oriol left us forever. As we stated in the paper, Oriol, it was fun working with you while you were among us. Now you are gone, but the good work remains. So long, friend. Ricard, Ismael, Núria and Toni. In Catalonia, agroecological cooperativism is part of a set of alternatives that appeared as a response to the current hegemonic food consumption model, controlled by large commercial establishments. It is defined by its promotion of short food supply chains (SFSCs), operates under the values of the social and solidarity economy (SSE) and holds a strong political commitment. This article, on the one hand, studies the setup of agroecological cooperativism understood as the outcome of a network of producers, intermediaries and consumers and, on the other hand, examines the impact of information and communication technologies (ICT) in the development of this consumption model. The data has been obtained through on-site interviews and online research on the 56 consumer groups and cooperatives present in Barcelona. Descriptive statistics and correlation analysis have been used to study them. The results prove the salient role that ICT has as a facilitator in the relational network established between the agents that take part in it, thus becoming a key characteristic element of the new agroecological consumer cooperativism. Espelt Rodrigo, R., Peña-López, I., Miralbell Izard, O., Martín, T. & Vega Rodríguez, N. (2019). “Impact of information and communication technologies in agroecological cooperativism in Catalonia”. In Agricultural Economics, 65 (2), 59-66. Praga: Czech Academy of Agricultural Sciences. Ricard Espelt, Núria Vega and I have just published an article at on consumption cooperatives: Plataformas digitales: grupos y cooperativas de consumo versus La Colmena que dice sí, el caso de Barcelona (Digital platforms: consumption groups and cooperatives vs. The Food Assembly in the case of Barcelona). 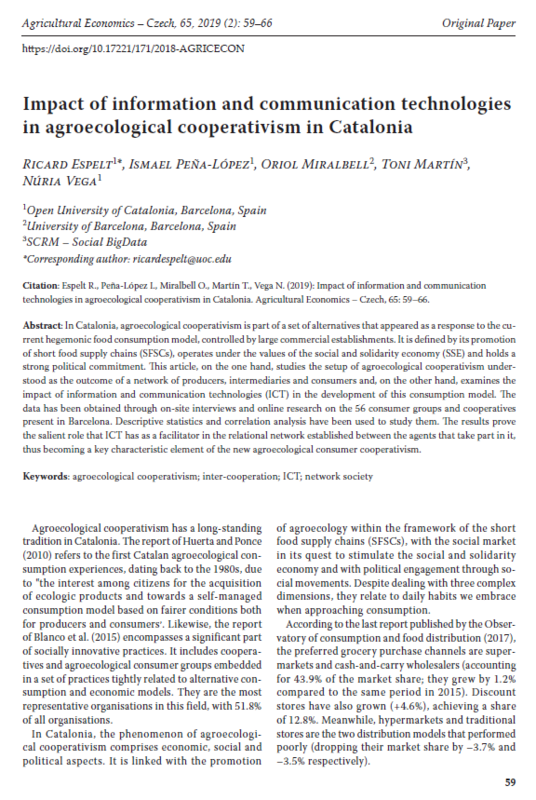 The article compares the emergence of agroconsumption groups and cooperatives in Barcelona since the mid 1990s with the most recent appearance of (presumably) platform cooperativism-based initiatives such as The Food Assembly. The main conclusions are that while agroconsumption groups and cooperatives are deeply rooted in the social and solidarity economy, and most of the times in the sharing economy, some platform-based initiatives not only do not share this principles but, as it is the case of The Food Assembly, they do not even match in what we understand by platform cooperativism. The article is in Spanish. An abstract in English follows and then the link for downloading the full paper. The cooperative tradition around the consumption of agro-food products has a strong historical background in the city of Barcelona. Even if we refer to the first modern consumer cooperatives, we realize that their task has twenty-five years of permanence (Espelt et al, 2015). More recently —in July 2014— appears in the city another initiative of consumption to facilitate direct sales between local producers and communities of consumers, called food assemblies. Although the origins and differences between models are evident, they both share some common aspects in their approaches —willingness to self-manage, disintermediation of production and building a community—, articulated as part of the so-called “Collaborative Economy”. For their part, both types of initiatives, although with a very different approach, have in technology an important backbone for their activity. In this article, we analyze the points of encounter and discrepancy between the two actors as a model, placing the research framework in the city of Barcelona, where —in March 2017— we located some sixty groups and consumer cooperatives (Espelt et al., 2015) And thirteen food assemblies, six in operation and seven under construction. Emphasizing as differential factors, economic, technical, legal aspects, type of governance, values associated with the model or linked to the relationship between people, producers, final product or space. Espelt, R., Peña-López, I. & Vega Rodríguez, N. (2017). “Plataformas digitales: grupos y cooperativas de consumo versus La Colmena que dice sí, el caso de Barcelona”. In Redes.com, 15, 145-174. Revista de estudios para el desarrollo social de la comunicación. Sevilla: NMI/Compolíticas. The last report of the collaboration with IT for Change has just been published: decidim.barcelona, Spain. Voice or chatter? Case studies. It belongs to the research project titled Voice or Chatter? Using a Structuration Framework Towards a Theory of ICT-mediated Citizen Engagement , and produced with the financial support of Making All Voices Count, a programme working towards a world in which open, effective and participatory governance is the norm and not the exception. This Grand Challenge focuses global attention on creative and cutting-edge solutions to transform the relationship between citizens and their governments. Making All Voices Count is supported by the U.K. Department for International Development (DFID), U.S. Agency for International Development (USAID), Swedish International Development Cooperation Agency, and Omidyar Network (ON), and is implemented by a consortium consisting of Hivos, the Institute of Development Studies (IDS) and Ushahidi. The programme is inspired by and supports the goals of the Open Government Partnership. The report which I have penned deals about the Barcelona (Spain) city council participation program called decidim.barcelona. Following I reproduce the executive summary and the link to download the full report. In September 2015, Madrid —the capital of Spain— initiated a participatory democracy project, Decide Madrid (Madrid decides), to enable participatory strategic planning for the municipality. Six month after, Barcelona – the second largest city in Spain and capital of Catalonia – began its own participatory democracy project, decidim.barcelona (Barcelona we decide) in February 2016. Both cities use the same free software platform as a base, and are guided by the same political vision. The success of these initiatives and the strong political vision behind them have spawned plenty of other initiatives in the country – especially in Catalonia – that are working to emulate the two big cities. These cities are sharing free-software-based technology, procedures and protocols, their reflections – both on open events and formal official meetings. What began as a seemingly one-time project has grown in scale. Participation leads to more pluralism and stronger social capital, which fosters deliberation, thus closing the (virtuous) circle of deliberative democracy. What remains to be analyzed is the strength and stability of the new relationships of power and how exactly these will challenge the preceding systemic structures and lead to newer ones. The culture of participation was hitherto scarce and mainly dealt with managing the support of citizens in top-down type initiatives. Changing the mindset implied turning many of the departments and processes of the City Council upside down – a need for new coordination structures, a new balance between the central administration and the districts, a speeding up of the slow tempos of the administration, and new ways to manage public-private partnerships. Using Anthony Giddens’ Structuration theory, this case study examines the e-participation initiative of the City Council of Barcelona (Spain), decidim.barcelona. The study analyzes the inception and first use of decidim.barcelona for the strategic plan of the municipality in the years 2016-2019. The case of the participatory process of the City Council of Barcelona to co-design, along with the citizens, the strategic plan 2016-2019 of the municipality is an important milestone, both in the local politics of the region, and in Spanish politics in general. It embodied the demands of the many that took to the streets in May 2011. The grassroots movement in Barcelona self-organized and won the local elections in May 2015, bringing their hacker and technopolitics ethos to the forefront of local politics. Not only does the way participatory process of early 2016 was put into practice matter, but also how it was technically designed and integrated into the core of policy making in sustainable and replicable ways. This is evidenced in the widespread adoption of this model across other Spanish cities and also by supra-municipal entities. The model, and the tool, is being replicated by Localret (a consortium of Catalan municipalities) and the Barcelona County Council. Both these institutions will replicate the initiative (participation model and technological platform) in other municipalities, while also creating a coordination team to share experiences and methodologies or prioritize needs for improvement. Invited to contribute proposals that will be debated and could translate into binding legislation (provided some technical and social thresholds are reached). Invited to monitor and assess both the process in its procedures as in its outcomes (in what has been called the Metadecidim initiative). This has been done not by substituting other channels of participation but by improving the traditional ways to engage in local politics (face-to-face, channeled through civil society organizations or other institutions) by complementing them with new ICT-mediated mechanisms. This case study is divided into three main sections. First, we examine the institutionalization of the ethos of the 15M Spanish Indignados movement, the context building up to the decidim.barcelona initiative. In the next section the methodology, the case, its design and philosophy are discussed in greater detail. Anthony Giddens’ Structuration theory and Bruno Latour’s Actor-Network theory are unpacked here. In the final section, the results of the project are analyzed and the shifts of the initiative in meaning, norms and power, both from the government and the citizen end are discussed. Peña-López, I. (2017). decidim.barcelona, Spain. Voice or chatter? Case studies. Bengaluru: IT for Change. Peña-López, I. (2017). 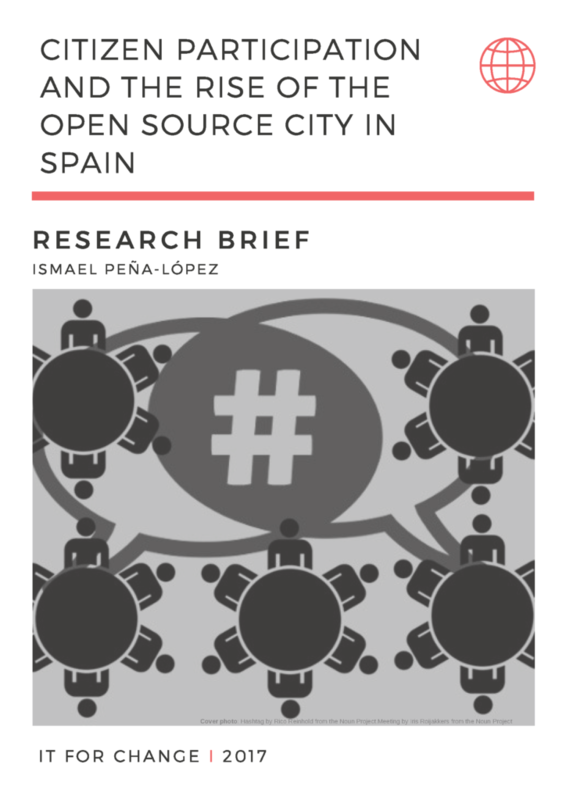 Citizen participation and the rise of the open source city in Spain. Bengaluru: IT for Change. Peña-López, I. (2017). State of the Art: Spain. Voice or chatter? Using a Structuration Framework Towards a Theory of ICT-mediated Citizen Engagement. Bengaluru: IT for Change. Peña-López, I. (2017). “Participation in Spanish Municipalities: The Makings of a Network of Open cities”. In ICTlogy, March 2016, (162). Barcelona: ICTlogy. Peña-López, I. (2016). “Participación electrónica en los municipios. De la emancipación ciudadana a la red de ciudades abiertas”. In Revista Internacional de Pensamiento Político, 11, 63-88. Sevilla: Universidad Pablo de Olavide. Peña-López, I. (2016). Technopolitics, ICT-based participation in municipalities and the makings of a network of open cities. Drafting the state of the art and the case of decidim.barcelona. ICTlogy Working Paper Series #3. Barcelona: ICTlogy. Peña-López, I. (2017). Sovereignty in the digital age. Keynote speech at the All Digital Summit, Barcelona 4-5 October 2017. Barcelona: All Digital. Peña-López, I. (2017). decidim.barcelona. from e-participation to the devolution of sovereignty. “ICT-mediated citizen engagement: Voice or Chatter?” webinar 5 July 2017. Bengaluru: IT for Change. Peña-López, I. (2017). Voice or chatter? Transforming democracy in technopolitical institutions. 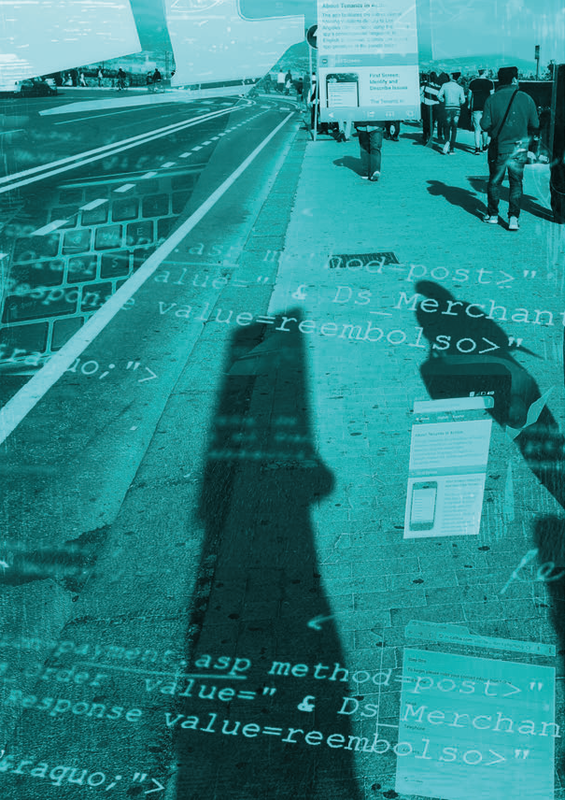 Civic Tech: creating and enabling networks for a liquid democracy. Maker Faire. 18 June de 2017 Barcelona: Caixa Fòrum. Barcelona: Ateneu Barcelonès. Peña-López, I. (2017). Voz o propaganda? Transformación democrática y tecnopolítica. Seminar for Civic tech? Utopías para el cambio, 3 July 2017. Barcelona: Escuela Cívica. Peña-López, I. (2017). Veu o propaganda? Transformació democràtica a les institucions tecnopolítiques. Cicle “La cultura del vot”: Quin futur per al reformisme democràtic? Anàlisi de les experiències conegudes a l’Estat espanyol. 12 de juny de 2017. Barcelona: Ateneu Barcelonès. From October 2016 to June 2017, Manuel Acevedo and I conducted the evaluation of the Open Data for Development program, a USD 15 million initiative (direct plus indirect funding) led by IDRC, the Government of Canada, The World Bank and DFID / UK Aid. This has been a terrific experience on many levels. The most important one was acknowledging how advanced the field is and, even more important, how deep the sensation is that a point of no return has been crossed in terms of open data, open government, transparency, accountability, open development, etc. Some important outcomes will, of course, still take some time to take place, but the path is been paved and the trend is gaining momentum quickly, adding up critical mass at each stage. The collaboration and excellent attitude of all the actors involved in the project (we interviewed 41 people and read more than 150 working documents and 128 bibliographic references) was another aspect of the work that is worth highlighting. Special gratitude goes to Fernando Perini, Erika Malich, Katie Clancy and Tricia Wind at IDRC. It is not every day that one finds people so willing to have their work thoroughly scrutinized, to explain things without making excuses, to expect the evaluation to be an opportunity to learn and to improve. Same goes for the team at the World Bank and the Government of Canada (especially Amparo Ballivian and Yohanna Loucheur, respectively). This impression of people taking seriously their work, including third parties’ evaluation and insights is confirmed not only by the publication of the report with the evaluation of the Open Data for Development program, but also the publication of the response of the Management of the program to our evaluation, providing both context and commitment to the recommendations made by the evaluators. Below can be downloaded the three documents generated by the evaluation: the full final report, the executive report and the management’s response. If I am allowed to, I would like to state that both Manuel and I are quite proud of the recommendations we made at the final section of our evaluation. Of course, the recommendations come from the many and richest inputs that everyone we talked to or read about kindly gave us. These recommendations are as follows. We hope the evaluation and, especially, the recommendations are useful not only for the program but for the whole open data and open data for development community. We remain at the disposal of anyone in need of more information, doubts or suggestions. The evaluation focuses on both accountability and learning. The primary intention of the evaluation is to provide accountability to the program’s management and organizational governance structures for program results. In addition, it reflects upon OD4D’s implementation in order to inform future programming on open data for development themes. The process was guided by five evaluative questions, on (1) Results, (2) Design, (3) Management, (4) Policy and (5) Gender. The evaluation report addresses these five topics, and also refers to some cross-cutting issues which were identified during the process. The analysis is completed with a final section with key recommendations for the upcoming new phase of the program. Acevedo, M. & Peña-López, I. (2017). Evaluation of the Open Data for Development program. Final report. Ottawa: IDRC. Acevedo, M. & Peña-López, I. (2017). Evaluation of the Open Data for Development program. Executive report. Ottawa: IDRC. International Development Research Center (2017). Management’s response to the independent evaluation of the OD4D program. Ottawa: IDRC. After the first state of the art report on the state of technopolitics and e-participation in Spain — State of the Art: Spain. Voice or chatter? Using a Structuration Framework Towards a Theory of ICT-mediated Citizen Engagement —, I have just had published a policy brief on the case of decidim.barcelona, the initiative of the City Council of Barcelona, Spain, to bring more horizontal e-participation procedures and, definitely, a bold strategy for the devolution of sovereigty to the citizenry of Barcelona: Citizen participation and the rise of the open source city in Spain . The policy brief — which precedes the thorough case study soon to be released — begins with the general context depicted in the state of the art report, shortly describes the experience of Barcelona and then goes to highlight the main impacts of the project, especially in what relates to policy-making for the future. This policy brief, as the aforementioned report, are the outcome of a collaboration with IT for Change under a research project titled Voice or Chatter? Using a Structuration Framework Towards a Theory of ICT-mediated Citizen Engagement , and produced with the financial support of Making All Voices Count, a programme working towards a world in which open, effective and participatory governance is the norm and not the exception. This Grand Challenge focuses global attention on creative and cutting-edge solutions to transform the relationship between citizens and their governments. Making All Voices Count is supported by the U.K. Department for International Development (DFID), U.S. Agency for International Development (USAID), Swedish International Development Cooperation Agency, and Omidyar Network (ON), and is implemented by a consortium consisting of Hivos, the Institute of Development Studies (IDS) and Ushahidi. The programme is inspired by and supports the goals of the Open Government Partnership. In September 2015, Madrid, the capital of Spain, initiated a participatory democracy project, Decide Madrid (Madrid decide), to enable participatory strategic planning for the municipality. 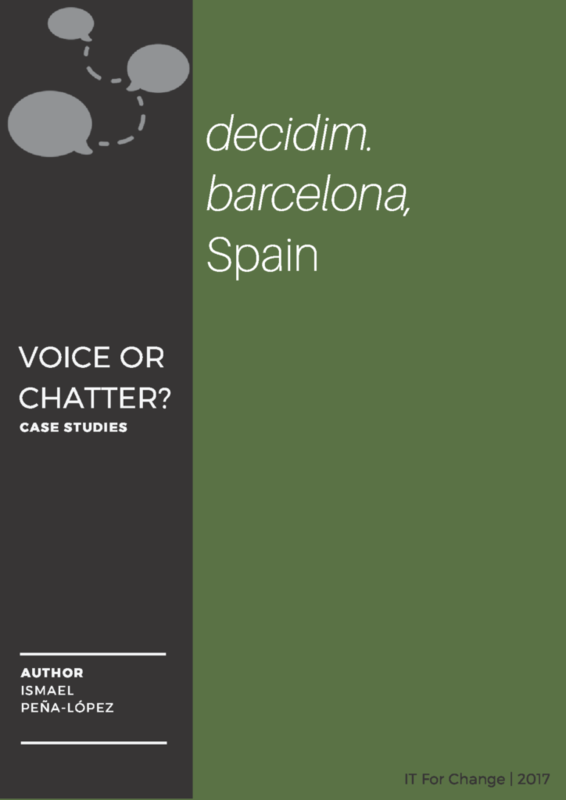 Less than half a year after, in February 2016, Barcelona – the second largest city in Spain and the capital of Catalonia – issued their own participatory democracy project: decidim.barcelona (Barcelona we decide). Both cities use the same free software platform as a base, and are guided by the same political vision. Since the 15M Spanish Indignados Movement, Spain has witnessed a silent but thorough democratic turn, from a crisis of representation to new experiments in participatory democracy, just like Decide Madrid or decidim.Barcelona. Grounded in the techno-political movements of the 15M, this turn reflects the critical role of ICTs (and their hacker ethics) in reconstructing politics, as discussed below. Peña-López, I. (forthcoming). decidim.barcelona, from e-participation to the devolution of sovereignty. A case study of ICT-mediation in Spain. Bengaluru: IT for Change. A year ago, Can Kurban, Maria Haberer and I presented a communication at the conference IDP2016 – Internet, Law and Politics. 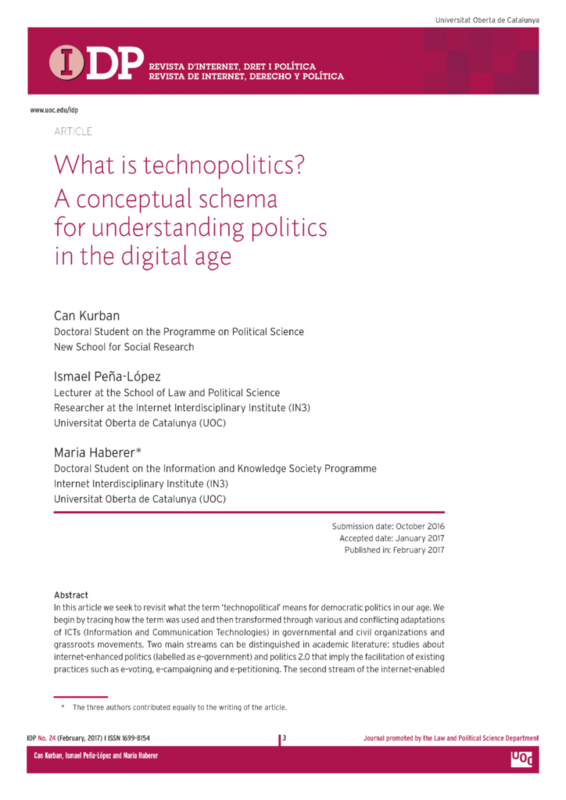 Building a European digital space, and it was published in its proceedings as What is technopolitics? A conceptual scheme for understanding politics in the digital age . In this article we seek to revisit what the term ‘technopolitical’ means for democratic politics in our age. We begin by tracing how the term was used and then transformed through various and conflicting adaptations of ICTs (Information and Communication Technologies) in governmental and civil organizations and grassroots movements. Two main streams can be distinguished in academic literature: studies about internet-enhanced politics (labelled as e- government) and politics 2.0 that imply the facilitation of existing practices such as e-voting, e-campaigning and e-petitioning. The second stream of the internet-enabled perspective builds on the idea that ICTs are essential for the organization of transformative, contentious politics, citizen participation and deliberative processes. Under a range of labels, studies have often used ideas of the technopolitical in an undefined or underspecified manner for describing the influence of digital technologies on their scope of investigation. After critically reviewing and categorizing the main concepts used in the literature to describe ICT-based political performances, we construct a conceptual model of technopolitics oriented at two contra-rotating developments: Centralization vs. Decentralization. Within a schema consisting of the five dimensions of context, scale and direction, purpose, synchronization and actors we will clarify these developments and structure informal and formal ways of political practices. We explain the dimensions using real-world examples to illustrate the unique characteristics of each technopolitical action field and the power dynamics that influence them. Kurban, C., Peña-López, I. & Haberer, M. (2017). “What is technopolitics? A conceptual scheme for understanding politics in the digital age”. In IDP. Revista de Internet, Derecho y Ciencia Política, 24. Barcelona: Universitat Oberta de Catalunya.